For the purposes of this article, I’m going to just discuss the times that missions have intentionally dug, drilled, or blasted holes in celestial bodies for the purpose of exploration. This leaves out important but purely symbolic acts of excavation, like leaving footprints and planting flags on the Moon. It also excludes all of the dozens of times spacecraft were intentionally or accidentally crashed into things. Many such early missions to the Moon ended that way, with the first being the Luna 2, a Soviet mission that impacted in September of 1959, less than two years after Sputnik. It wouldn’t be until late December of 1966 that the first craft designed to dig a hole would land on the Moon. 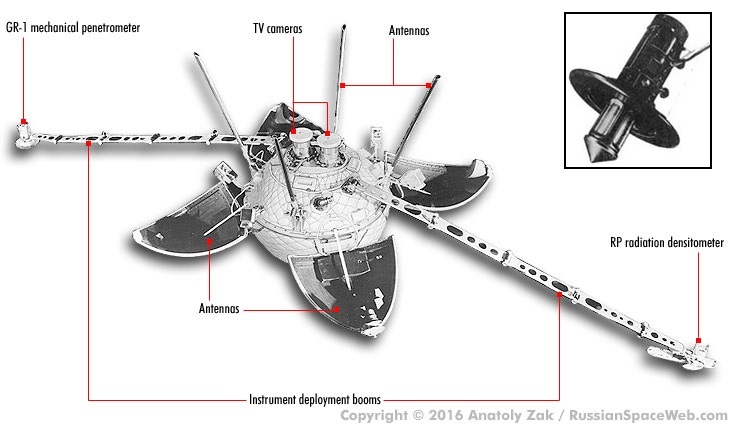 Luna 13‘s mission was to assess the suitability of the lunar surface for a manned Soviet landing that would never come. The main instrument was a penetrometer, attached to the end of a long boom deployed after landing. The instrument had a short rod with a sharpened tip and a small solid-propellant rocket motor to drive it down into the lunar surface. It penetrated 45 cm into the regolith and measured the density and consistency of the soil. That first human-made hole in the Moon was followed four months later by Surveyor 3, one of a series of American probes designed to find suitable locations for landing the planned Apollo missions. The lander carried a Soil Mechanics Surface Sampler (SMSS), and extendible pantograph arm with a small soil scoop on the end. The arm had azimuth and elevation control motors in its base, allowing it to range in a wide arc, and telemetry allowed engineers to infer the forces on the regolith from the current drawn by the motors. The SMSS was very busy for 18 hours, controlled in near real-time through the lander’s slow-scan TV camera. It dug multiple trenches, pressed down on the lunar surface, and did impact tests by dropping the scoop from a height. It even picked up a rock and tried to crush it; sadly, the scoop didn’t have enough oomph for that. Subsequent Surveyor missions also gathered SMSS data, sufficient to be reasonably sure the Apollo missions would be able to land safely and return with samples from the Moon’s surface. Apollo 11 was the first successful sample return mission, and returning samples from the Moon was considered so important by mission planners that one of the very first things Neil Armstrong did after setting foot on the Moon was to scoop up a small “contingency sample” with a plastic bag on a sampling stick. The sample, tucked into a pocket on his suit, was intended to at least get some bit of the Moon home, in case they needed to abort the mission before collecting anything else. It was the first few grams of the 382 kg (!) of soil and rocks returned over the six Apollo landings, some scooped up, some shoveled, and some obtained by core drilling. While most of the action of the late 1960s and early 1970s focused on the Moon, our planetary neighbor was also slated for exploration. Soviet attempts to visit the Red Planet began in 1960, but it wouldn’t be until 1971 that they would succeed in landing a spacecraft successfully. The Mars 3 mission had a lander that looked remarkably like the Luna program landers, and carried not only a robotic arm with a scoop for sampling the Martian soil, but a small rover that was supposed to scoot about autonomously on skids and contained a penetrometer similar to that on Luna 13. Sadly, contact was lost with the probe a mere 15 seconds after it landed, and none of the planned science was performed. Five years later, the American Viking program succeeded with two Mars landers, Viking 1 and Viking 2. Both landers were identical and were specifically designed to sample the Martian soil to search for life. 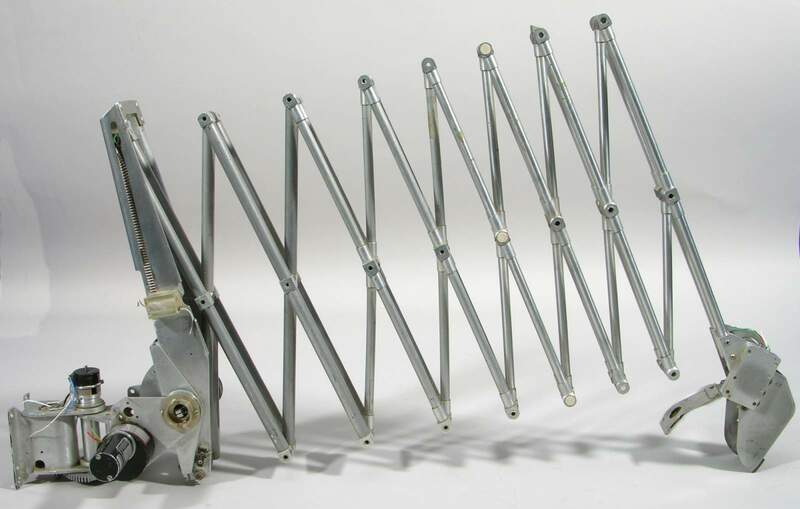 The sampler arm was an ingenious device, a boom that could extend 10 feet (3 meters) and drive the sampler head into the soil but still retract enough to deliver the samples to the various science packages on the top of the lander. The boom was basically two large stainless steel bands, somewhat like giant tape measure blades with the concave sides facing each other and connected at the edges. The boom, containing a ribbon cable for the sampler head, flattens as it rolls onto a reel and expands as it pays out, making it stiff enough to dig into the soil. The results of Viking’s chemical and biochemical analysis of the Martian soils were, unfortunately, inconclusive. Further excavation of the Red Planet would have to wait a while, as mission after mission sent to Mars failed. Finally, in 2003 the Mars Exploration Rovers Spirit and Opportunity arrived and began their epic 15-year trek across the planet. Each rover carried a Rock Abrasion Tool (RAT), a small diamond grinding wheel on the end of a robotic arm. Pressed up against a rock, it spun at 3000 RPM and ground holes up to 5 mm deep, exposing unweathered rock for the rovers spectrometer and other instruments to analyze. Still, all these excavations on the Moon and Mars have barely scratched the surface. That’s changing now with the Mars InSight mission. InSight itself touched down on Mars back in November, and has since deployed an instrument intended to make the deepest extraterrestrial hole yet. 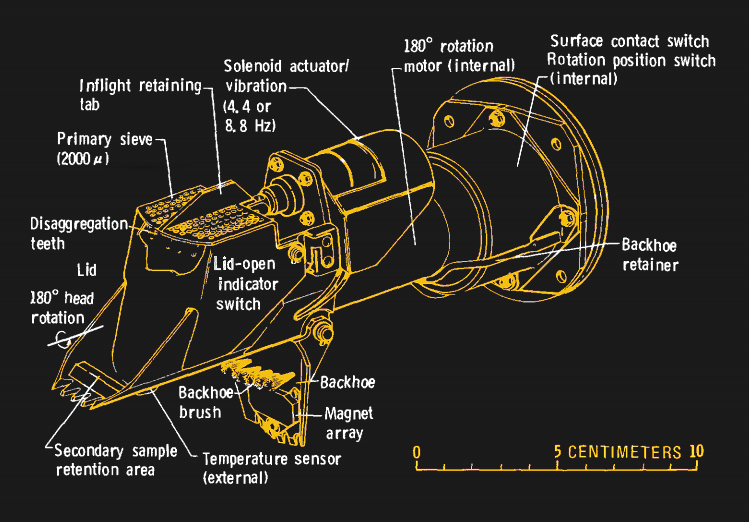 The Heat Flow and Physical Properties Package (HP³), placed on the surface by the lander’s robotic arm, contains a self-drilling sensor package, dubbed “the mole.” Operating in much the same way as an ordinary cordless impact driver, the mole is supposed to burrow into the Martian regolith, trailing a tail of sensors. The maximum depth it can reach is 5 meters, but it’s currently stuck at about 30 centimeters. It may have hit a rock or patch of gravel, in which case it doesn’t look good for going any deeper. The major celestial bodies are not the only places subject to our digging. The minor planets that litter the solar system have been visited as well, the first being the asteroid 25143 Itokawa, upon which the Japanese probe Hayabusa landed in 2010. The intention was to fire a projectile into the asteroid’s surface and collect the ejecta for return to Earth, but the sampler failed. Still, the dust swirled up by the probe was enough to capture about 1500 grains of asteroidal material, which was brought home safely for analysis. Hayabusa2, a follow-up mission currently in orbit around asteroid 162173 Ryugu, touched its sampler horn to the surface in February and fired a tantalum bullet into the surface, collecting ample ejecta. A more powerful penetrator, consisting of a 2.5 kg copper slug propelled by a shaped charge, will be fired at the surface next month, generating a 2 m wide crater and exposing material that hasn’t been subject to the ravages of space. 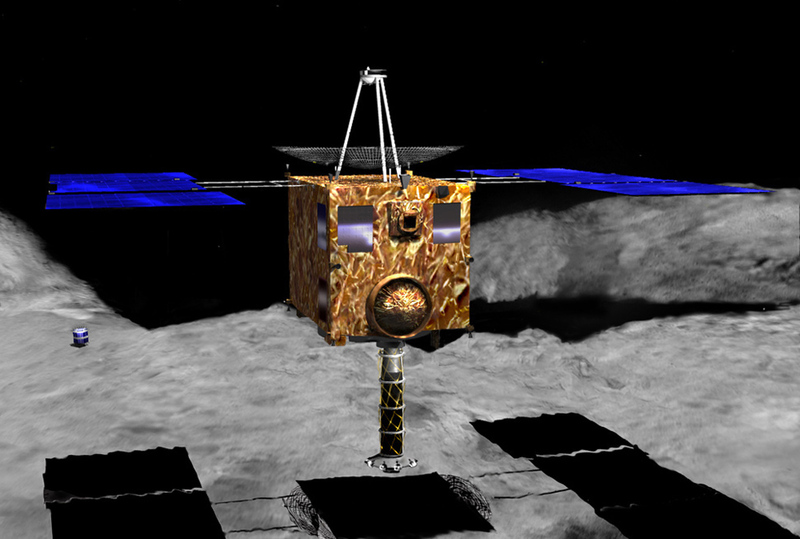 Hayabusa2 will sample material from the manmade crater and package it up for the trip home in 2020. NASA has its own asteroid sample return mission in progress, OSIRIS-REx, currently surveying asteroid 101955 Bennu. Once it finds a suitable site, the probe will descend to let the Touch-and-Go Sample Acquisition Mechanism (TAGSAM) contact the surface. TAGSAM’s excavations will be decidedly less energetic than the Hayabusa probes; regolith will be blown into the sampler using puffs of nitrogen gas. That will be enough to collect the minimum 60 grams of material needed for analysis on Earth. Given the treasure trove of scientific data generated by analyzing these samples, it’s not likely that we’ll stop scooping, blasting, scraping, and puffing holes in other worlds anytime soon. Wherever we go, if there’s a surface to dig into, you can bet we’ll find a way to do it. Wreckage should still be there…somewhere. Imagining a cartoon depicting a far future landscape dotted with all the wreckage of failed robots. Between failed probes, successful impactors, and the debris from all the Apollo missions – LEM ascent and descent stages, fairings, couplings, and even the S-IVB third-stage rockets from Apollo 13 through 17 – the Moon is a boneyard. https://en.wikipedia.org/wiki/List_of_artificial_objects_on_the_Moon – an estimated 189,000 kg of stuff is up there! Totally remember that from TV in the late 70s! Tickled my fancy then, tickles it still. edit: There was also another TV movie, likewise terribly cheesy, that was about a teenage boy who stowed away aboard a moon mission. Of course he somehow saved the mission and returned a hero. Forget the name of that one. Until those lunar landings, scientists had no idea what it would be like to land on it. One train of thought had the Moon covered with meters of soft dust which wold have swallowed any thing that tried to land on it. One lander design being considered up until then was a based on a giant stick pin. Arthur C. Clarke’s 1961 story “A Fall of Moondust” was based on that idea. That was before it was discovered that without any atmosphere, the sharp grains of the regolith pack very tightly just a short distance below the surface. If anyone is interested in seeing experiments in larger-scale regolith collection, I would highly recommend looking at the NASA Robotic Mining Competition. I am a member of one team competing this year. It is a lot of fun, so maybe someone else on the internet can get some enjoyment by seeing what these teams have been doing. That Soil Mechanics Surface Sampler is straight-up Rube Goldberg. Robots digging hole in extraterrestrial objects? Anyone else think of this? In some parts of the world they still sit in the dust and scratch at roots with a stick ! Is the robot in the lead image named Stanley Yelnats IV? I don’t think there’s any way for them to back that Insight Mole out of the hole: the tether management would have been a nightmare, and the backend of the mole is already 10 cm below grade. It’s a one-way trip, and they talk about the limited number of actuations that the Mole hammer mechanism has (although the don’t seem to know what the upper limit is).